First beer of the Wisconsin Beer Plow. And here's an oddity- as far as I can tell, there's no "brewing company" or "brewery" or even "beer" in this joint's company name. It's just Ale Asylum. 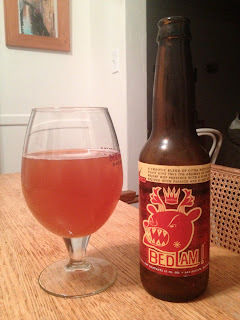 Anyway, I don't know what the hell the beast on the label is supposed to be, but I like it. To be perfectly honest, I'd advise against even bothering to go to the website to read the beer's description. It's incredibly pretentious and massively overloaded with douche-ness. Oh, I see why- it's a BA review, copied and pasted. And it's unbearable even on the BA scale. But the beer smells delicious. This SOB is Citra-hopped, and that's right at the forefront- buttloads of citrus, pineapple and maybe even a bit of lime in there. There's a potent bitterness in the smell, and with all of that citrus, it smells like rind. And then there's a nice rich Belgianity carrying some banana along with it (and maybe some vanilla lurking in the back), with a good amount of the usual Belgian spice. Off the bat I like this- the IPA part is pretty much on point, with the hops bringing all of the expected citrus, a nice bitterness level that won't strip the paint, and an agreeably light body that keeps it drinkable. And initially, the yeast provides a nice counterpoint. But on repeated visits, I'm having a bit of trouble enjoying the Belgian part as much as I do the IPA part. And I think that's because the spices that are evident in the nose are either lacking in the flavor or hidden behind the hops. So the yeast ends up mainly just yeast-flavored, without much enhanced complexity. And more's the pity, because one-note Belgian yeast is a real shame. So this isn't bad, but I feel like it's a bit of a letdown because the Belgian part fell short. I wonder how it'd compare to the Wildeman Andy reviewed a little while ago- probably not all that favorably, because it's not on Cali-Belgique's level, and it's nowhere even in the ballpark of River North's HUP or Muffin Top. But I'll give it credit- it's easy to put down, and after two or three of them the truncated Belgianity won't really bother you anymore.